An expansion of this interchange is one of many improvements aimed at solving capacity constraints in Union Station and the entire D.C. area transit system. Data visualization is just one piece of Metro’s Office of Long Range Planning’s work to address and envision the transit future for the area. Metro launched a new website last week, PlanItMetro.com, to share information and collect feedback from residents as the agency develops its long-term Regional Transit System Plan, that focus on Metro’s ability to serve the growing transit needs of the area. (View a PDF of the plan here.) It is projected that Metro will reach its capacity ar0und 2040, requiring system-wide capital improvements. And given the length of time – 10 to 20 years – it takes to design, fund, plan and construct metro improvements it’s a good thing Metro is starting now. The D.C. region’s population will increase by 31 percent by 2040, according to the plan’s projections. Trips to the District’s core will likely increase by 12 percent and trips between suburban areas will increase by 45 percent. In 1999, Metro’s board endorsed a plan to add more than 50 percent more “guideway miles” to Metro, with the commitment to double ridership by 2025. Problem: Metro will reach capacity in 2040 even with the use of eight-car trains. Increasing current capacity for travel to the district’s core is essential. A special priority is major transfers and central stations. Possible solutions include new rail lines as well as inter-rail and station pedestrian connections. Problem: Station access for pedestrians, cyclists, bus and automobiles is lacking. Metro also experiences high unmet parking demands, though a significant number of those parking come from less than three miles away. Strategies include improving the pedestrian environment around Metro and developing Park-and-Ride facilities, with feeder service to rail. Problem: Traffic congestion threatens the efficacy of the region’s bus networks. Regional streetcar and bus rail proposals are being developed independently, posing a threat to the effectiveness of a surface transit network. Such proposed networks include: Virginia’s Route 7 streetcar, the D.C. streetcar, the Columbia Pike extension and the construction of the Purple Line. The solutions Metro has proposed involving enhancing existing service through running-way improvements, higher frequency of service, instituting bus rapid transit (BRT) systems, integrating light rail and streetcars, and expanding metrorail to new markets and activity centers as they emerge. 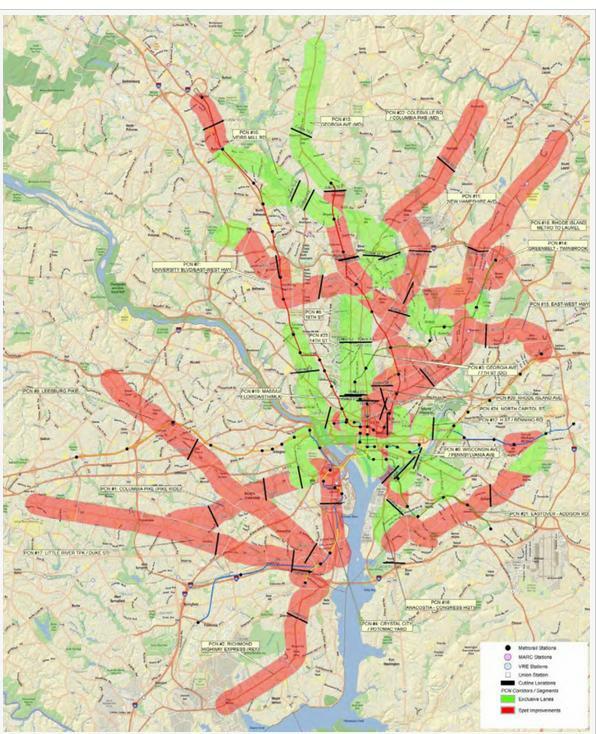 A map of metrorail’s bus priority corridor network (PCN) identified for priority treatments like restructured routes and schedules, bus lanes, transit signal priority, queue jumpers, bus stop location, and off-board fare payment systems. Recommended dedicated lane corridors are in green and spot treatments corridors in red. The new website and blog is part of Metro’s outreach for its long-range plans. Next year will bring scenario models and analysis with a draft plan and preliminary recommendations rolling out by the summer of 2011, largely developed through stakeholder input. Presumably Metro will read and respond to reader comments. This is a fairly low threshold to cross, compared to other transit areas, whose “High Frequency Maps” include a higher standard of service every 12 minutes (Los Angeles example), and service that operates 7 days per week. Metro chose these criteria because more stringent criteria would result in very few routes being included. This could point to where the Metrobus system could improve its service. How can we get more routes on this map? What routes are close to being included and how much funding would it take? Are there route alignments that we could change to provide effectively more “frequent network” service? How can we expand this map to weekends too, or to extend the hours earlier or later? What upgrades to routes would be necessary and how much would that cost? How can we encourage people to use proximity to the “frequent network” as part of their marketing? Right now apartment rental ads or businesses often advertise their proximity to “Metro”, meaning Metrorail. Would it be a benefit to advertise that a business is “on the frequent Metrobus network”? 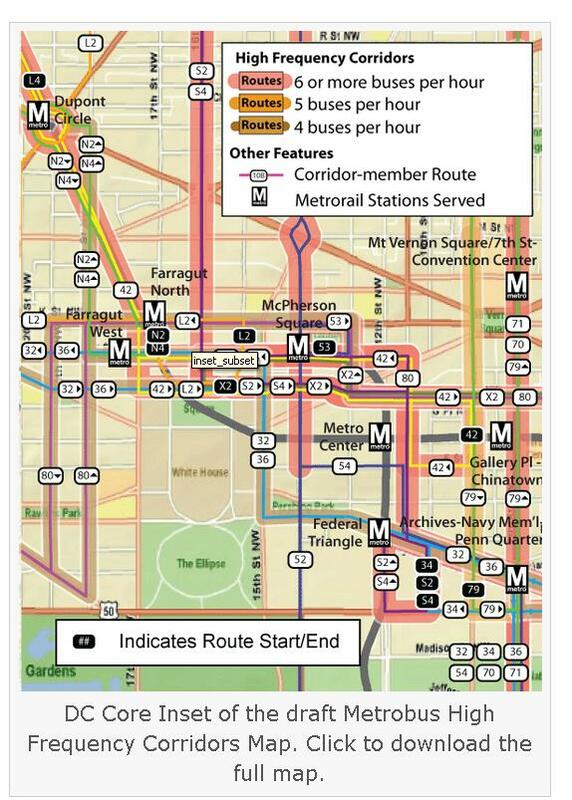 Metro proposed map showing bus route frequency. Tags: D.C., mass transport, metrorail, public participation, regional planning, United States, video, Washington, D.C.